A man is in danger of losing his sight after an "unknown substance" was hurled in his face by two men. 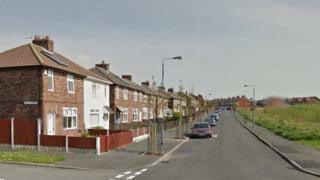 The man was standing by his car in St Helens, Merseyside, when the "unprovoked attack" took place at about 21:20 BST on Sunday, police said. He then began to suffer breathing difficulties and "extreme irritation to his eyes". A police spokesman said: "Early indications are that the victim could potentially lose his sight." The man was assaulted in Milton Street, Sutton Manor. His attackers were described as white, wearing bubble jackets and aged in their 20s. They were last seen heading towards Jubitts Lane. Det Insp Lisa Ryan said: "This was an unprovoked attack and inquiries are ongoing to establish the full circumstances in relation to the incident."